The Bure Valley Path Cycle RouteThe Bure Valley Path for cycling and walking. A nine-mile route through the picturesque Bure Valley between historic Aylsham and Wroxham in the heart of the Broads. It follows the narrow-gauge Bure Valley Railway and halts are provided at Brampton, Buxton and Coltishall to put down or pick up passengers on request, including bikes (subject to space). Enjoy views of the stunning restored Buxton Mill, sip champagne at Hautbois Hall or take a boat journey around the Broads at Wroxham. Parking: In Hoveton or nearby Wroxham. Distance from nearest train station (please name station): Hoveton (starts at station). 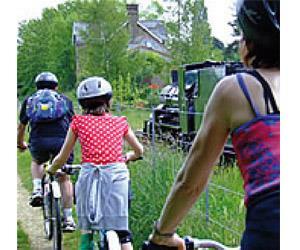 Points of interest: Walkers can join any of the Bure Valley Railway's scheduled services. There are also intermediate stations at Brampton, Buxton and Coltishall for those walkers not able to walk the full nine miles between Aylsham and Wroxham. Enjoy views of the stunning restored Buxton Mill, sip champagne at Hautbois Hall or take a boat journey around the Broads at Wroxham. The Bure Valley Path for cycling and walking. A nine-mile route through the picturesque Bure Valley between historic Aylsham and Wroxham in the heart of the Broads. It follows the narrow-gauge Bure Valley Railway and halts are provided at Brampton, Buxton and Coltishall to put down or pick up passengers on request, including bikes (subject to space). Enjoy views of the stunning restored Buxton Mill, sip champagne at Hautbois Hall or take a boat journey around the Broads at Wroxham.